Doki-Doki Universe arrives on Dec. 10 for the PlayStation 3 and 4 and PlayStation Vita, the game's developer, HumaNature Studios, said earlier today. It will be $14.99. The game is available over PlayStation Network and cross-buy is supported, so getting it for one system is as good as getting it for all three. Doki-Doki Universe features a story mode, 31 "personality quizzes" and the "Doki-Doki Mail" messaging system. A "starter pack" demo features 16 personality quizzes, mail, a tutorial planet, and the home planet of protagonist QT3, the alien robot assigned to learn about humanity. 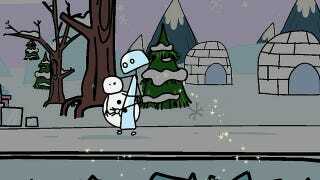 Doki-Doki Universe is set on a planet called Brr, where QT3 encounters and goes exploring with a Snowman called Junior. Don't ask, just go with it. There will be a livestream on Dec. 10 (next Tuesday) on the official PlayStation channel on Twitch to fill you in on the rest.